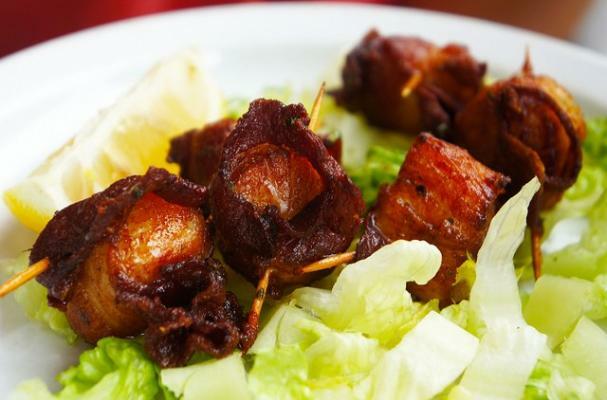 WOW your New Year's Eve guests with these delicious bacon wrapped scallops. This appetizer is so quick and easy to make, you'll be able to enjoy the party while spending limited time in the kitchen. You can prepare this dish ahead of time and cook them just before serving. Mix olive oil, lemon juice and pepper in small bowl. Pour over scallops and marinate in refrigerator for about an hour. Wrap each scallop with 1/2 strip of bacon. Keep together with toothpick or put 3-4 on each skewer. Place on broiler pan. Broil in oven until golden brown and bacon is done to desired crispness. You can use whole shrimp instead of scallops. Serve hot.